Nerf guns are enjoyed by boys and girls around the world. But did you know that the word Nerf stands for non-expanding recreational foam? This is what the darts are made of, and makes them both soft and light. In the past few years, enough darts have been sold to circle the earth four times! Every year over 445 million darts are manufactured, and George Clooney is a die-hard Nerf fan. He loves to sit in his director’s chair and shoot actors whenever they mess up a scene. Delivering the ultimate in blaster performance, the Nerf Rival Khaos MXVI-4000 is perfect for high-velocity shooting, unleashing rapid fire with a fully motorized design. It can fire 40 rounds at a speed of up to 100 fps. The easy-load magazine lets you rapidly fill it up with the next rounds, and you can shoot each one when the trigger is pressed, or hold down the acceleration button to release all 40 rounds quickly. The Khaos Rival has a trigger lock, ambidextrous magazine release, and sights on the front and rear to make centering in the target easier. What do you imagine when you hear the word “Mastodon”? Something big? Well, you’re right. 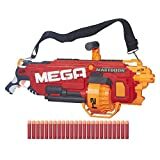 This massive Nerf gun has a rotating drum that rotates and holds 24 Mega Whistler darts and can fire them up to 100 feet. To make it easier to carry it has a shoulder strap. In the box, you receive the Nerf blaster, a 24-dart drum, a drum cage, a couple of drum covers, a handle, strap, 24 darts and an instruction manual. It is powered by 6 “D” batteries. The Modulus offers the best in high-performance sports action. The clear housing lets you see in detail how the gun works and can be illuminated when the light switch is pressed. Want to go into stealth mode? Just turn it off and stay undetected. Perfect for playing in low-light environments, these lights are relatively strong and can light up a small area around the blaster. The Nerf Modulus Ghost gun is motorized, and the clip holds 12 darts that can fire rapidly. It uses 4 AA batteries. It is a gun that can be upgraded with extra kits and accessories that have more than 1000 possible combinations, so the fun never ends. 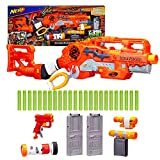 This Nerf gun is one of the new 2018 models and has a fully motorized Speed-Load technology for automatically loading the darts into the drum. 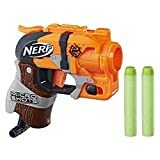 Instead of having to take out the drum to reload, here you simply insert the Nerf darts and they get loaded, and you can even keep firing while this is happening, so there are no more interruptions and the action can continue as long as you have darts available in your pockets. The dart drum can hold up to 30 units for plenty of firepower, and by holding down the acceleration trigger the blaster’s motor powers up and starts firing. The Elite Infinus is compatible with most other Nerf N-Strike Elite clips and drums and uses 4 D batteries. 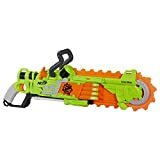 Just released in 2018, the Nerf Prometheus is what you need if you’re looking for an intensive game. Featuring an Advanced Acceleration System, this gun can unleash up to eight rounds per second, with a fully motorized mechanism. The hopper is easy to load and can store up to 200 rounds, although some people have claimed to be able to load it up with even more, so might as well grab yourself a pack of extra bullets. 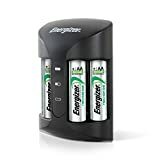 Unlike other models, with his one, you won’t have to worry about batteries since it includes a NiMH rechargeable one to power up the gun. Nerf Rival Prometheus has a trigger lock, a shoulder strap to carry it around, and a tactical rail. It is not a gun for precision, but perfect for having fun while you shower your rival with a couple of hundred rounds. Another Nerf gun released in 2018, the Elite Quadrant is a compact gun for shingle shots. The 4-dart rotating drum blasts one dart at a time. You just load the darts into the drum, pull the handle back, and fire by pressing the trigger. No batteries to worry about. 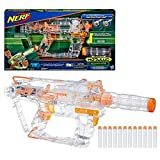 The Quadrant Nerf blaster fires the darts at an average speed of 70 feet per second and is capable of shooting any standard Nerf Elite darts, be it the blue, green, white, orange, purple, Accustrike, or decorated Rebelle ones. Zombies are ready to take over the world, but with the cool Nerf Brainsaw Blaster they won’t stand a chance. On the front there is a foam saw blade that spins around when you pull the blaster’s string. 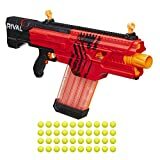 In the blaster you can hold eight darts and fire one at a time with pump-action blasting. No batteries needed. The box includes the Zombie Strike Brainsaw Blaster, eight darts, and an instruction manual. 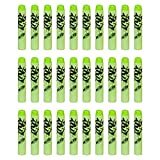 Grab yourself a pack of extra darts for longer play time. 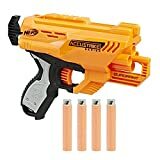 Just in for 2018, the Thunderhawk blaster gun is one of the biggest guns and uses AccuStrike Nerf Mega Darts, which are well known for their accuracy. 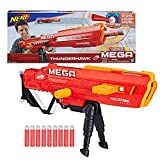 Ten darts are included, and this gun measures a whopping 41 inches when fully extended, making it one of the largest Nerf guns ever. You can adjust the length by sliding the barrel to accommodate your needs in combat. The fold-down bipod lets you stabilize it for distance shots in a fixed position. Although Accustrike darts are recommended, it is fully compatible with regular mega darts. Keep in mind that this gun is more powerful than other models, so it is not recommended for young children. Recommended for at least eight years old and up, but perfect for dad to have some fun also. 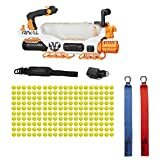 These adorable mini Nerf guns are a fully-functioning tiny version of their respective larger models and include a Nerf Microshots N-Strike Elite Strongarm, a Nerf Microshots N-Strike Elite Firestrike, and a Nerf Microshots Zombie Strike Hammershot, each one with two darts. Each blaster is individually packaged, so this is the perfect Christmas gift. Actually, it’s three gifts in one! And even though they are mini Nerf guns, they use the regular, standard darts. Although they are perfect for kids eight years and up, we’ve heard of many naughty grownups that like taking these into the office and shooting darts at their fellow workers when they are distracted. Their small size is perfect for hiding them. Another great gun for battling the zombies and this one includes many accessories to make the job even easier. 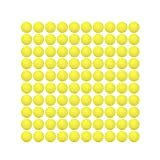 The Nerf scavenger holds 12 darts at a time, and another dozen can be stored in the extra clip. The tactical light slides into the rail for low-light situations, and when things get tough and you shoot out all your rounds, use the hidden 2-dart blaster for a quick backup. A barrel extension makes it possible to modify the blaster for distance targets, and the blaster uses an on/off slam fire button. Switch it to an on position and keep moving the lever to shoot the darts faster.